On November 13, 1002, English king Æthelred II the Unready ordered the killing of all Danes in England, known today as the St. Brice’s Day massacre. When Æthelred became King of the English in 978, his realm had experienced repeated incursions by Danes. The situation was so bad that the English king even had to pay tribute to Denmark’s king starting in 991. Not surprisingly, Æthelred would eventually want some kind of way out of these humiliations. So, he decided to take decisive action on the feast day of a fifth century Bishop of Tours. On that day, the English king ordered what we might in effect call the genocide of all Danish men in England. We historians do not know the total number of Danes slain in the massacre, but the remains of 34 to 38 men aged 16 to 25 found in 2008 may be what is left of some of the victims. Possible named victims also include the sister of Denmark’s king along with her husband. 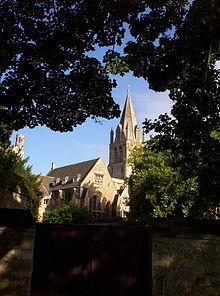 St Frideswide’s Priory, now Christ Church Cathedral. As can be imagined, killing the Danish king’s sister among other notable Danes might not necessarily result in a Viking monarch just turning the other cheek. 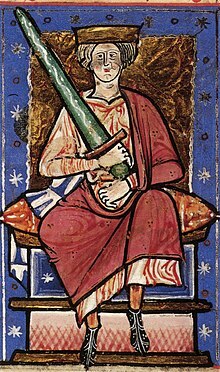 Instead, this king, Sweyn I Forkbeard, conducted further raids against the English over the next decade culminating in an invasion that oddly enough occurred almost exactly 1,000 years ago in 1013. 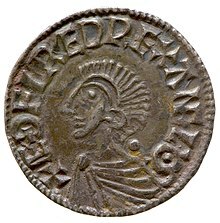 In fact, Sweyn’s invasion was so successful that he managed to force Æthelred into exile in Normandy, while Sweyn was crowned King of England on Christmas Day of 1013. Sweyn died just five weeks later in February of 1014. Æthelred then returned for a short second reign, dying in 1016. In that same year, Sweyn’s son, Cnut the Great would reconquer England for the Danes and rule a northern empire that included England, Denmark, and Norway. Thus, Æthelred’s attempt to purge England of Danes was a failure that only invited more intense Danish incursions on English soil. Questions for students: Was Æthelred justified in his attempted purge of Danes from England? Why or why not? Tout, T. F. (Thomas Frederick). An Advanced History of Great Britain From the Earliest Times to the Death of Queen Victoria: With 63 Maps and Plans, by F.T. Tout … (1909). Cornell University Library, 2009. The featured image in this article, a gold mancus of Æthelred wearing armour, 1003–1006, photographed at the British Museum by PHGCOM, has been released into the public domain by the copyright holder of this work. This applies worldwide. Next Article The Saint Who Liked To Spank!